ok so your website has really helped other people know what i'm going through and its now good to know what surgery and stuff i'll be getting. i'm pretty much prepared for whats going to happen during and after surgery. i'm 15 years old and i'm going to have to get lateral release surgery after cheerleading. i have patella femoral syndrome in both knees but worse in my right knee. also when i walk or stand up straight my right knee turns in, is that normal? my hips are really weak and hurt often. but my knees hurt all the time. 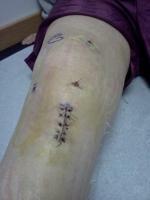 so i'm thinking i should get surgery on my right knee first and then like a few weeks later get it done on my left knee. is that what i should do? how long do you think i would be out of cheerleading for? and i have a leg longer than the other (i'm 5'7 1/2 and 5'9). does that have anything to do with my knees and hips?